Learn how to use Silverlight to create gorgeous mobiles apps for the Windows Phone. 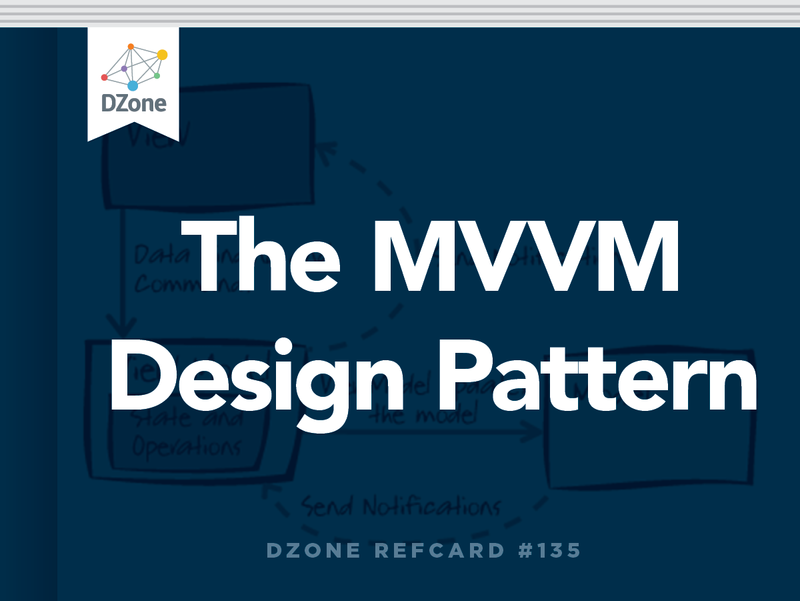 Included in this Refcard is everything from an explanation of the MVVM Design Pattern to some examples of MVVM Project Templates. If you are developing a Silverlight application for the Windows Phone, then this Refcard is probably for you. For all but the most trivial of applications, the Model-View-ViewModel (MVVM) pattern provides a solid pattern to follow for building a well structured and maintainable application. Microsoft has taken that message seriously with Windows Phone by basing three of the four Visual Studio application project templates on the MVVM pattern. This card provides an explanation of the MVVM pattern, how it’s supported and how to follow it on Windows Phone. As a side benefit, the content is almost entirely applicable to Silverlight desktop, web, slate and Windows Presentation Foundation (WPF) applications as well. Why MVVM on Windows Phone? MVVM is an architecture pattern introduced by John Gossman in 2005 specifically for use with WPF as a concrete application of Martin Fowler’s broader Presentation Model pattern. Implementation of an application, based on the MVVM patterns, uses various platform capabilities that are available in some form for WPF, Silverlight desktop/web, and on Windows Phone with a little help from other libraries. Many commercial applications, including Microsoft Expression products, were built following MVVM. The benefits of MVVM are listed as follows and can be largely summed up in the phrase “Separation of Concerns”. Modular architecture: given good inter-layer interface definitions, components can be built and well tested independently. Loose coupling: with one-way dependencies, changes to one layer don’t require the other to be changed, rebuilt or retested. Role separation: responsibilities and expertise can be focused (e.g.,designers can build UI without needing to write code). Tool friendly: the design of the pattern and the capabilities of the platform mean that different tools best suited to the skills of the user can be used. These tools include Visual Studio for developers and Blend for UI designers. Maintainability: as with other patterns, a well-structured design makes it easier to make modifications when updates or upgrades are done. Less coding: the separation also leads to areas of development with less code, which means less room for error; it also means less regression testing when changes are made. Testability: the pattern enables automated unit testing of code and minimizes the need for UI-based testing. The MVVM pattern is not a set of all-or-nothing rules that one must strictly adhere to. It may not be appropriate for all applications, especially small ones where implementing MVVM may require too much overhead. The MVVM pattern encourages developers to build their application as three layers with the dependencies shown. The Model is the object model for the application. It can also be the ‘layer’ for data and/or business logic that are completely devoid of UI features and any dependency on the platform UI libraries or runtime. It can hold state and/or perform processing on the state relevant to the business/problem domain. The data or the operations performed on the data may be dealt with entirely in process memory (e.g., the current value of rolled dice), or they may be retrieved, stored and processed remotely using a data repository/service (e.g., a database or web service) with the model in memory representing a subset of the available data (e.g., specific customer records). By creating a Model that is not bound to a single platform, it is easier to share the data model across Silverlight, WPF and WP7 platforms with the potential for reuse of model documentation, direct code or even binary libraries. Recommend basing MVVM development on Silverlight 3 to ease code sharing with WP7, Silverlight 3/4 and WPF 4. The View is a ‘layer’ that represents and handles all the UI elements, including both displayed UI (e.g., classic ‘buttons’ and more sophisticated displays) and UI-user interactions (e.g., screen touch, button press, etc.). There can be several Views over the same data with varying detail, depth or representation (e.g., summary + details, order +. order + order line items, charting). One of the capabilities a platform needs to enable the MVVM pattern well is the ability to create UI declaratively with text instead of code. Those declarations can include parts that ‘bind’ visual elements to data available in the Model, such that value or list changes stay in sync between the View and Model data. This minimizes or replaces imperative code for settings values between the View elements and data in the Model. Also, since code in the UI can be difficult to test (with automation), this reduces or eliminates the amount of UI-updating-related code to be tested. The concept of binding can also be used to bind a user-driven event to an action to be performed against the data in the Model. Creation of a View declaratively also opens up the possibility that someone with good design/interactivity sensibilities can design the View (perhaps with a more designer-focused tool) without coding/library expertise and somewhat independently from the software developer. It may be that the Model code is not controlled by a developer and also does not expose data in a way that allows a View to be bound to it. In this case, the ViewModel wraps the Model data to expose in a way that allows for declarative binding with update notifications. The Model may have data types that may not directly match the types used by the UI components/libraries (e.g., a boolean value on the Model may need to become a visibility enumeration specific to the UI libraries). In this case, the ViewModel wraps the Model and performs the conversion between the View and Model via the IValueConverter interface when data binding. There are other complex operations beyond conversion to be performed that are not UI related but don’t necessarily belong in the Model for the business/problem domain (e.g., some kind of Aggregation or Visualization computation). Having this code in the ViewModel means it’s easier to test. The state of UI selection needs to be stored and tracked, but this does not belong in the Model. The ViewModel is also usually responsible for initiating operations to retrieve and store Model data, which allows it to track operation state and, therefore, expose visual feedback or state information to which the View can bind. The actual operation (and obtaining progress) may be delegated to Model-specific classes. The View only knows about the ViewModel. It does not know about, nor does it have any reference to or dependency on, the Model. The reverse is also true; therefore, the Model and View can be maintained separately using the ViewModel as the ‘buffer’. The ViewModel only knows about the Model. It does not know about the View. Therefore, new views can be added without affecting the ViewModel. Given the use of binding, it may even be possible to update the ViewModel without breaking the View. The Model only knows about itself. It does not know what ViewModels are wrapping it or what Views are created on top of the ViewModels. In any case, all layers share a common knowledge of and are tightly coupled to the basic types/objects of the underlying platform. For the latest release of the free Windows Phone developer tools, go to http://create.msdn.com/. A complete guide to building and deploying a simple MVVM-based WP7 application for the marketplace is available - http://bit.ly/WP7Die. To start creating a Windows Phone application based on the MVVM pattern, select File->New Project in Visual Studio, select “Silverlight for Windows Phone” from the Installed Templates and then select one of the template types. To build from scratch, select “Windows Phone Application” or see the section below about MVVM support in other templates. A Model may be placed in a separate class file or project/assembly, or (as is often the case for simple cases) it may be incorporated into the ViewModel. The ViewModel is a CLR class (typically in a separate class file and sometimes in a separate assembly) that encapsulates the Model or incorporates it. If the Model includes nested objects or collections of objects, then a corresponding ViewModel class hierarchy may be created. The primary goal is to expose the Model data and actions on the model data to the View for binding. If the View only takes values from the ViewModel once at initialization, there would be nothing more to do. But typically, the UI updates to reflect value and collection changes in the ViewModel data (and possibly vice versa, e.g., for TextBox changes). The built-in UI controls for single values on Windows Phone (e.g. TextBlock, TextBox, etc.) used in the View are amongst the controls that look for the INotifyPropertyChanged interface on classes to which they are bound; therefore, the interface should be implemented on the ViewModel. It consists of just one event, and it is standard practice to create a helper method to fire the event, which is then called by the setter method of the properties as they are changed. Using INotifyPropertyChanged in a class requires this statement. Remember that the integer named Value is the Model data in this class. When the property setter method for Value is called, it checks to see if there is a change. If so, calls the helper method that will inform the View (if bound to that object and property) that something has changed. If a Model has nested/collection objects and the UI needs to bind to changes in the properties of those objects and there is access to the Model code, then it be may easier to incorporate the model/classes into a hierarchy of ViewModel classes. Otherwise (if the Model is not editable), then access to data change events from the Model is needed to fire the PropertyChanged event. To help catch otherwise silent runtime binding notification errors, the helper function could be augmented with a reflection-based check to ensure the PropName passed in matches an actual property. The View layer in Silverlight applications can be implemented in code or declaratively using XAML (where, simply put, at initialization, elements become objects and attributes becomes properties). For Windows Phone, the View is a typically a PhoneApplicationPage or a UserControl. Any object used in the View that inherits from FrameworkElement (i.e., the visual controls) has a DataContext property which can be set to a .NET object. Any descendent FrameworkElement in the visual tree of the XAML page will also have the same value for its DataContext unless explicitly overridden (in which case its nested XAML descendants have that new value, and so on). … and the DataContext set on a FrameworkElement item. Per Application instance – in this case, the ViewModel (and possibly a hierarchy of nested ViewModels) is created in the App.xaml XAML as a resource (as above), and then parts of it are bound as the DataContext at the root of different Views. This makes sense when the Model data must be available throughout the application’s lifetime. Using a ViewModel locator in the XAML. The DataContext of each view is bound to properties of an application-instance-bound object using the Path syntax. When the property of the root ViewModel is retrieved (following the View-specific Path) for binding, the getter method can dynamically hand out an instance of the appropriate ViewModel. Combine this with dependency injection and mock encapsulated Models (when the application-instance-bound object is created) for a powerful way to dynamically assign real or mock ViewModels and Models, thus providing support for ViewModel testing, web-service-based Model integration testing and design-time visual designer editing. Keep Models encapsulated rather than incorporated into ViewModels to enable clean dependency injection testing using mock Models. With the DataContext property correctly set on the FrameworkElement-derived visual element, various properties can be ‘bound’ to properties (or descendent properties) of the DataContext object. This can be done programmatically or declaratively. … which shows how to use inherited and explicit descendent DataContext and the basic binding syntax. The example also shows different data binding options (below) with TwoWay being applicable to a TextBox where the updated should be transferred back to the ViewModel to set the Model data. OneTime ViewModel property value copied to View element upon initialization. Seldom used, but could help performance. OneWay (default) ViewModel property value copied to View element upon initialization and when ProperyChanged event called. TwoWay Same as one way, plus value copied back from View element to ViewModel property – triggering event various by visual element type. Overall, using data binding and other View model coupling (shown later) reduces or eliminates UI code that can otherwise be hard to test when driven by user actions. When Model types don’t match View types (e.g., Enumeration type to String), the ViewModel can do the conversation or a converter can be used. To create a converter, create a class derived from System.Windows.Data.IValueConverter and implement Convert() and ConvertBack(), declare an instance of the class in the page (or application) resource (as with ViewModel creation case 2 above) and then add the converter to the binding syntax, for example. Use Converts (vs. conversion in ViewModel) if they are reusable and relate to UI on one end, not for transforming business data. Three of the project templates included with the free Windows Phone developer tools, as indicated, are based on MVVM. Build on these templates and create custom Visual Studio templates for increased team productivity - http://msdn.microsoft.com/en-us/library/6db0hwky.aspx. The information in the previous sections together with the following guide to MVVM pattern use in the provided templates should help bring clarity to basic use of MVVM on Windows Phone. A single instance of the ViewModel called MainViewModel (incorporating Model data) is created using the singleton pattern and exposed as the ViewModel property on the App object in the App.xaml.cs file. The ViewModel class is defined under the ViewModels folder. It has a collection of ItemViewModel objects implemented using ObservableCollection. MainPage is the primary View and its DataContext is set in code to App.ViewModel in the page’s constructor in MainPage.xaml.cs. For the Databound Application, the DataContext for the DetailsPage View is set in code to an item in the App.ViewModel.Items collection in the page’s constructor in DetailsPage.xaml.cs. Consider separating Models, Views and ViewModels into separate folders in Visual Studio Solution Explorer. In order to take actions (e.g., load/save data), perform operations (e.g., compute some results) or perform some navigation, a method is needed to convert a user interaction event within the View (button press, touch, etc.) into a method call on the ViewModel class. This is done by exposing ‘Commands’ on the ViewModel that, when executed, either perform the action in the ViewModel or delegate it to the Model or some other library. A command is implemented as an object property on the ViewModel (which can be bound to by the View) that supports the ICommand interface that is defined on Windows Phone under System.Windows.Input. The Execute() method is self explanatory. The CanExecute() method is provided so that a visual element bound to the object can query whether execution is currently possible and potentially update itself visually to indicate the state. The CanExecuteChanged event should be raised by the ViewModel whenever the ability execute or not has changed. On the interaction side, there needs to be a way to connect user interactions with exposed commands. Silveright controls have events to which code-based event handlers can be attached, but this is UI code that is hard to test. In the Silverlight platform for the desktop/web, the controls derived from ButtonBase (e.g., Button) have a Command property which can be bound to the ICommand-based object properties on the ViewModel, and the Button works with the ICommand interface as one would expect. However, these are not implemented in Silverlight 3 and Silverlight for Windows Phone. In addition to no direct ICommand support in Windows Phone for controls to bind to commands, exposing potentially many command objects, with each one as a private class nested inside the ViewModel class can be quite time-consuming and verbose. While it’s technically possible to improve these two issues by creating helper classes (to make exposing commands easier) and creating Behaviours (to bind UI events to commands) that can be used in code, XAML and XAML-based tools like Blend, it makes sense to use available third-party libraries to accelerate this process. One such library is part of the MVVM Light toolkit available from GalaSoft - http://www.galasoft.ch/mvvm/installing/manually/ or use NuGet. In the ViewModel constructor, instantiate the command so that it calls the private method when Execute() is called on ICommand by the UI. Optionally, add a second lambda expression to the RelayCommand constructor that will be checked when CanExecute() is called on ICommand by the UI. If necessary, call RaiseCanExecuteChanged() on the command object when the ability to execute the command changes, so that bound UI knows to call CanExecute() to update any visual cues. Repeat steps 3 to 7 for each command to be exposed. Optionally, if the control has an IsEnabled property to be set according to the CanExecute property and CanExecuteChanged event on the ICommand-enabled object, set the MustToggleIsEnabledValue to True, e.g. Repeat 2 to 3 for all controls to be bound to exposed commands. To ease implementation, consider inheriting ViewModels from a library base class (or create one), including support for the INotifyPropertyChanged interface inheritance/implementation and helper functions. Commands with DelegateCommand – similar to RelayCommand in MVVM Light. The free tools for Windows Phone include a version of Blend that can be used for design. Blend has a UI optimized for UI design, over coding. If a developer produces ViewModel and Model classes, a UI designer can then produce interactive UI in Blend and bind to the ViewModel, producing XAML in the project that can then be loaded back into Visual Studio. Don’t call web services or database in the View or ViewModel constructor – the designer may not load. To see the design of the UI, try to use XAML over code, since controls added programmatically will not show up. Instantiate empty collections in constructors so they can be bound to. If possible, use the full ViewModelLocator pattern to allow switching at design-time to mock ViewModels with design data or mock Models injected into the ViewModel. If that route doesn’t suit, then at least consider using design data (see below). The project templates in the tools that support MVVM also show examples of design-time data under the SampleData folder. Since XAML can fundamentally be used to declare objects and properties, it can be used to declare sample ViewModels (including nested object/collection properties). By using the d:DataContext (with the design-time namespace prefix) in XAML (see MainPage. xaml in the Data Bound application), the DataContext can be set on the page or sub-element to use the static sample data. A designer using Blend to build UI on top of ViewModel classes provided by a developer can use a feature in Blend that automatically generates XAML sample data based on the class properties of the ViewModel or Model as well as generate XAML sample data based on XML files. HttpWebRequest/Response class, or service proxy class inc. OData proxies) or if data is stored locally, this would involve classes under System.IO and System.IO.IsolatedStorage or third party databases (e.g., Sterling DB or Perst). If properties are serializable, it may be convenient to just serialize the ViewModel and Model state using classes under System.Xml.Serialization. Having an application-instance-based object with one or more ViewModel properties may provide a convenient ViewModel ‘hub’ for all the pages in your application. An application may have volatile session-specific Model data (e.g., data entry in progress and not yet saved) and/or View Model UI state that can be lost if the application is ‘tombstones’ (de-activated by the OS to preserve foreground application performance or to perform another task and possibly never re-activated). When using MVVM with TextBox controls bound to data, use something like the Prism UpdateTextBindingOnPropertyChanged class in XAML to ensure all Text changes are transferred through the binding prior to a tombstone or Application bar event. Has Microsoft Lost Its Mojo With Developers?